When a classic stew is this good, there’s no reason to hurry, you try this recipe and find out why. 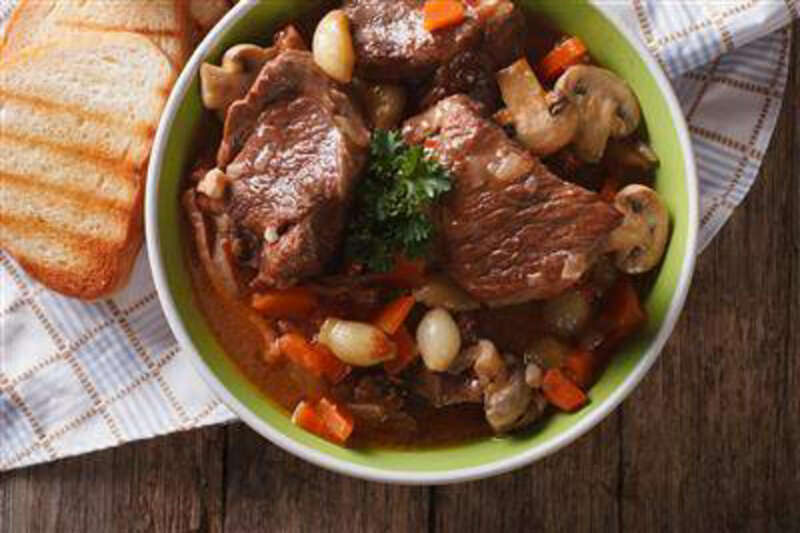 This soothing and hearty beef bourguignon is worth your time and efforts. Enjoy with plain bulgar and roasted asparagus. RecipeSavants.com When a classic stew is this good, there’s no reason to hurry, you try this recipe and find out why. This soothing and hearty beef bourguignon is worth your time and efforts. Enjoy with plain bulgar and roasted asparagus. Smart Recipes, European Recipes, Beef Recipes, Recipes Beef European Beef Bourguignon PT2H20M Serves 4 Ingredients: 3 Pounds Beef Chuck 2.25 Teaspoons Kosher Salt 0.5 Teaspoon Freshly Ground Black Pepper 5 Ounces Lardons, Pancetta Or Bacon 1 Onion 1 Large Carrot 2 Cloves Garlic 2 Tablespoons All-Purpose Flour 1 (750-Milliliter) Bottle Red Wine 1 Large Bay Leaf 1 Large Thyme Sprig 8 Ounce Pearl Onions 8 Ounce Large Cremini Mushrooms 1 Tablespoon Extra-Virgin Olive Oil 1 Pinch Sugar 0 Chopped Fresh Flat-Leaf Parsley 1 Teaspoon Tomato Paste Season beef with 2 teaspoons of salt and 1/2 teaspoon of black pepper. Keep aside at room temperature for at least 30 minutes or refrigerate for up to 24 hours. Heat a large Dutch oven over medium-low and cook lardons for about 10-15 minutes or until crisp. With a slotted spoon, transfer lardon onto a paper towel lined plate, leaving fat in the pan. Return pan over medium-high heat and cook until lardon fat starts to smoke. Place half of beef cubes in a single layer and cook for about 10-15 minutes. With a slotted spoon, transfer beef cubes onto a plate. Repeat with remaining beef cubes. Preheat the oven to 350 degrees. In the same pan, add carrot, onion and remaining ¼ teaspoon of salt and cook for about 10 minutes, stirring occasionally. Stir in tomato paste and garlic and cook for about 1 minute. Stir in flour and cook for about 1 minute. Add wine, thyme and bay leaf and scrape brown bits from bottom of pan. Add cooked beef and half of cooked lardons and stir to combine. Cover the pan and transfer to oven. Bake for about 1 1/2 hours, flipping meat once in the middle. Meanwhile, in a large skillet, add mushrooms, pearl onions, oil, 1/4 cup water and a pinch each of sugar, salt and black pepper over high heat and bring to a boil. Reduce heat to medium and cook, covered for about 15 minutes. Increase heat to high and cook, covered for about 5-7 minutes, tossing frequently. Divide stew into serving bowls and top with mushroom mixture evenly. Garnish with parsley and serve hot.